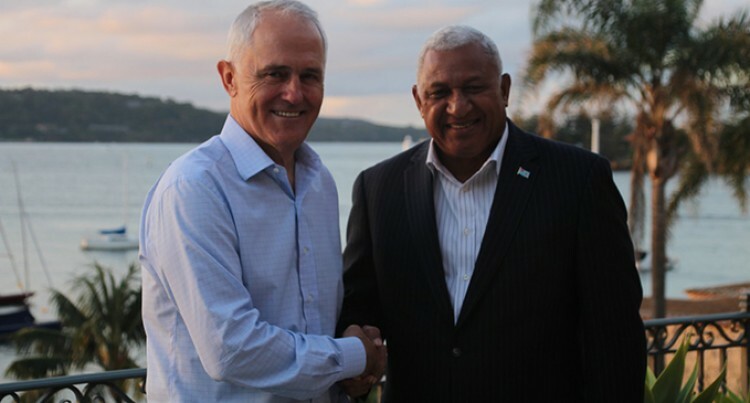 Prime Minister Voreqe Bainimarama’s meeting with his Australian counterpart Malcolm Turnbull is significant for the future of climate change adaptation and mitigation. Mr Turnbull will soon be making his way to United States of America to meet American President Donald Trump. USA’s position on climate change will no doubt be on the agenda. And, the need to change that position will also be on Mr Turnbull’s mind. As the president of COP23, Mr Bainimarama is keen to see the United States coming to the table to discuss climate funding and the need for all parties to see through on the Paris Agreement. His visit and meeting with Mr Turnbull is an important step in the efforts to change the mind of the American President on climate change. President Donald Trump, who has claimed the “concept” of global warming was concocted by the Chinese to hurt American manufacturing, had vowed to withdraw from the Paris climate change treaty, abolish the Environment Protection Authority’s climate policy role, scrap Barack Obama’s centrepiece Clean Power Plan and dismantle any curbs on fossil fuel developments. There are indications that Mr Trump may have a change of heart and the world is waiting to see whether this happens. Mr Bainimarama’s presidency, therefore, comes at a critical time. If America decides to abandon the Paris Agreement, it will be a big blow to climate change negotiations. Fiji is counting on Australia to help influence the US, Japan and New Zealand. Mr Bainimarama will also outline Fiji’s priorities at the Australasian Emissions Reduction Summit in Melbourne. Mr Bainimarama has said that he intends to act as COP President on behalf of all 7.5 billion people on the planet. But he will bring a particular perspective to these negotiations on behalf of some of those who are most vulnerable to the effects of climate change – Pacific Islanders and the residents of other Small Islands Developing States (SIDS) countries and low-lying areas of the world. Our concerns are the concerns of the entire world, given the scale of this crisis. As he has stated, we must work together as a global community to increase the proportion of finance available for climate adaptation and resilience building. We need a greater effort to develop products and models to attract private sector participation in the area of adaptation finance. To this end, he has advocated engaging closely with governments, NGOs, charitable foundations, civil society and the business community. Australia’s support will be a major boost to the Fijian presidency of COP23 in achieving its goals. The international effort to reduce global warning has reached a critical stage – the implementation phase after the Paris Agreement. Every help Fiji can get will be crucial in the success of the Fijian presidency.